Kelley Atlee has been dancing for over 40 years. She was a long-time student and graduate of the LaPierre School of dance in Reading, where she studied under the direction of Margaret LaPierre in ballet, tap, jazz, and lyrical. She was a 1989 graduate of the Dance Teachers Club of Boston and received the Marjorie Duff ballet Scholarship. She studied dance at the University of Massachusetts at Amherst and spent her summers at José Mateo Ballet Theatre in Cambridge, MA and Jeanette Neill dance studio. After graduating college she returned to the LaPierre School of Dance where she taught p re-dance, technique in ballet, tap, jazz, lyrical and beginner classes for adults. Kelley has certifications through the Dance Teachers club of Boston, CORE BARRE™, and AIS-Active Isolated Stretching (THE MATTES METHOD). She has spent the last seven years teaching Barre and Ballet throughout the seacoast. While most of her time is spent raising her three daughters, she adores her THRiVE for Women "Family" and always strives to keep her classes fresh and light-hearted! Val Berezin was a member at THRiVE for Women for several years, and loved it so much that she and her husband decided to acquire the business in November 2018. Val is an RYT200 and youth certified yoga instructor. She has practiced yoga in a variety of forms for many years, but discovered Power Yoga in 2016 and has been hooked to the mind and body benefits ever since. After working as an investment professional for nearly a decade, she decided to leave the field in September 2017 to spend more time with her two young children and figure out her next pursuit. Always interested in health and wellness, she completed her 200hr yoga training in 2018. Her focus is on empowering others to take risks, live big, and be open to new possibilities. Val is a board member of SATYA, which is a non-profit with a mission to increase access to therapeutic yoga for at-risk and vulnerable populations in our Seacoast community. She is on the finance committee for the New Hampshire Women's Foundation and is also involved at Portsmouth's Krempels Center, an organization that supports people living with traumatic brain injuries. Val treasures her family the most, and enjoys spending time with her husband, two children, and their dog, and has a passion for traveling and adventure. After being home full time with her young daughters for several years, Barbara returned to teaching three years ago as an AFAA Certified Instructor. With a passion for high intensity interval training, Barbara will provide you with challenging workouts every single class to get you working to your optimal performance level! Caroline loves leading others to enjoy the benefits of exercise as she sees it—feeling your best to get the most out of life. The Brentwood mother of three has been teaching group classes at THRiVE since 2006, and has offered personal training since 2014. Caroline is Aerobics and Fitness Association of America (AFAA) certified Group Exercise Instructor and Personal Trainer, and is certified by the National Academy of Sports Medicine as a Fitness Nutrition Specialist. She leads up to 12 group fitness classes per week, including Cardio-based HIT training, Step, Kickboxing, Pilates, Yoga, Cycle, Aqua, and Strength classes. As a trainer, Caroline develops a safe experience for each participant by creating uplifting and appropriate exercises and movement, demonstrating and supervising correct body mechanics and correct use of exercise equipment. Through small group training and the Weight Loss Challenge, Caroline aims to educate, mentor, monitor, and motivate women in safe exercise practices, leading them to life-long healthy lifestyle changes. These include exercise testing, disease management, physician prescription and safe progression. She has published articles on wellness and exercise, working alongside physicians. Rose has been teaching the early morning cycle classes at THRiVE for 10 years. She also teaches on the Saturday rotation. She is certified in Madd Dog Spin, and Les Mills RPM. She is also a Certified Personal Trainer. "The members keep me coming back!" Suzanne Dunn has always been an athlete, so taking the step to become a group fitness instructor seemed like a natural move. The Exeter resident has been training clients at THRiVE since 2008, where she also teaches Step Aerobics, Bosu, Strength, Cardio Mix, and Couch to 5k. Suzanne has several group fitness certifications, as well as advanced degrees in nutritional counseling and health coaching. June has 28 years in the fitness industry. She loves sharing all the education she has been privileged to receive, whether it’s cardio, in the form of dance, step, drills, or the flow of a pilates, barre, or yoga class. June also is interested in nutrition, cooking (especially plant based), mindfulness and meditation, natural movement, being outdoors! NASM certified group and personal trainer 500-hour level yoga teacher, and is Barre-certified PIYO certified. Jessica Gutstein has been practicing yoga since 2002 and began teaching Vinyasa Yoga in the Boston area in 2007 after completing her 200 hour yoga teacher certification. Jessica has practiced multiple forms of yoga and has had the extraordinary opportunity to learn from teachers in several locations around the world. As a competitive athlete for most of her life, she found that yoga helped her find balance in a nurturing environment and was initially drawn to yoga for it’s therapeutic benefits. After becoming Barre certified in 2017, Jessica found that both yoga and barre enhanced the powerful connection between mind and body. Her Barre Fusion classes bring together the synergistic elements of both modalities to provide a unique and challenging environment for all participants. Carrie’s passion and success in running and triathlon led her to a career in the fitness industry. Carrie is a certified Personal Trainer and Group Fitness instructor and specializes in cycling. She is the mom of two girls, with another baby due in February 2019. Balancing life can be difficult but Carrie believes that finding time for your health is very important and a great example for family and others. Carrie is officially certified in ISSA Personal Training, ACE Group Fitness, and Red Cross CPR/AED/First Aid. Pamela is a fitness instructor and certified personal trainer. She teaches 'Bootcamp Blast' which is interval-based and modifiable such that each participant can work at her own pace. 'Bootcamp Blast' was developed and choreographed by Pamela. She pulls from her vast experience as an athlete, fitness enthusiast, as well as her cardio kickboxing and cycling teaching experiences. Bootcamp Blast incorporates body-weight movements, strength movements, core conditioning, and more. Moves are matched with the music to mirror intensity and intent - follow the beat and let your body find strength and power. It's such a Blast you don't realize you're at Bootcamp! Daniela is a CYT350 certified Sivananda Yoga Teacher, E-CYT500 certified Classical Yoga Teacher, Y12SR certified 12-Step Recovery Yoga Teacher, certified Children's Yoga Teacher and Reiki Master with more than 25 years of teaching experience. Daniela is always motivated to empower people going through life’s transitions with spiritual understanding and practical tools, to make life richer, easier, and more meaningful. She infuses all of her yoga classes with mindfulness practices, compassion, and EASE. Her seamless style of working simultaneously with the body, mind, and spirit creates inspiring classes and a deep healing experience. I moved to Exeter over three years ago with a background in athletics and a spin certification. As a "stay at home mom" at the time, I was eager to continue teaching so I decided to stop by THRiVE to see if they were looking for instructors. Cindy and Paula were so welcoming and supportive! Cindy immediately incorporated me into the cycle teaching rotation and my youngest son joined the childcare room. I continue to teach cycle classes on Saturdays and enjoy the warm, supportive environment at THRiVE. Every member is there to do their best and achieve their goals. It is a judgement free, fun and supportive environment. The goal for my classes is for every individual to challenge themselves and leave feeling like they worked their hardest. My fitness tip is to establish a routine based on what works for you! Do you enjoy working out in the mornings, lunchtime or afternoon? What forms of exercise leave you the happiest and most rejuvenated? Set realistic goals for yourself and work hard to achieve them! My final tip is to have a positive mindset when approaching exercise - tell yourself you CAN and you WILL. Remember, you can always do more than you think you can! The 37-year-old Newmarket resident became a personal trainer in 2012, due to her desire to help people attain their goals and live a healthy life. “I knew that I had personally benefitted tremendously in my life from exercise and wanted to share that with others,” says Holly. Exercise and fitness in Holly’s own life has included competing in a figure competition in 2015, as well as physique challenges. In addition to working with clients in a personal training setting, Holly teaches TRX small group classes, Functional Fitness, and served as a trainer for Thrive’s Heart Rate Weight Loss Challenge. She has also been a functional coach since 2012. Christina Newman is a RYT200 and 95-hr Childlight yoga instructor. She is a resident of Hampton, NH. She is a California native and has also lived in Alabama and Massachusetts. She has been practicing yoga for nearly 20 years and has been inspired by Baptiste Power Yoga, vinyasa, ashtanga, yoga nidra and restorative yoga teachings. She has used her yoga practice in all aspects of her personal life, former corporate career and raising her 2 young children. Christina is known for her enthusiasm, passion and love for yoga for both children and adults. While a perfectionist in nature, she has learned the power, strength, peace and love that comes with NOT being perfect. Learning to be calm when life gets messy through meditation, journaling and yoga. Her class (whether it is with children or adults), will offer the ability to connect your heart and mind to connect with your own strength. She will be able to show you that yoga meets you (yes YOU) where you are in your life and will be committed to growth and a deeper connection with yourself. Kristen joined THRiVE after the birth of her second daughter, in 2007. While she enjoyed every class she participated in, she found a true love for vinyasa yoga. In 2012, Kristen became a RYT-200 through YogaFit and has been teaching at THRiVE ever since. As a mother, wife, full-time business woman (which often requires work travel), volunteer and yogi, Kristen understands the need for mindy/body balance. She's enjoyed watching the many women at THRiVE find a passion for yoga in order to bring balance to their lives. When she's not teaching, Kristen works full time as National Director of Business Development for The Enrollment Management Association based in Skillman, NJ. She's also a trustee at Oxford Academy in CT and a former board member at New Generation in Greenland, NH. Kristen is a graduate of Exeter High School as well as the University of New Hampshire. She currently resides in Exeter with her husband, Brendan, two daughters; Carey and Hagan, and two dogs; Sierra and Bruschi. Sarah originally became interested in pilates after her pregnancy, when she was looking to regain core strength, as well as build longer, leaner muscles, enhance my compromised alignment, and focus on developing mind-body awareness. After years of commitment, she restored these facets of health through devoted mind body work in Diane Attenborough’s pilates classes, as well as other phenomenal exercise classes at THRiVE, and with the support of childcare and staff at THRiVE. Thereafter she began a new career path in becoming a STOTT Pilates instructor. Through Northeast Pilates in Manchester-by-the-Sea, an award winning licensed training center, she begin an intensive instructor training program, and at the end received her Matwork certification. All of this was enhanced by her Master's in Education, dance background and continuous work toward mind body health. Sarah constantly strives to find ways to help people reach personal goals toward health. Pilates is a foundation to all exercise; building core strength, pelvic and scapula stabilization, long lean muscles, body alignment, posture and flexibility. Pilates is for everyone; those returning from rehabilitation, beginners, to elite athletes. Come try a Pilates class, a semi- private or private session. Sarah will work with you to create a body that feels aligned, lengthened, toned, flexible, stabilized and mobilized, with renewed mind body awareness and energy! Dana Rossignol's own weight loss journey led to her current work as a personal trainer and group fitness instructor at THRiVE. "Several years ago, I lost a substantial amount of weight and decided that I wanted to enter the world of health and wellness to help others. I understand how hard starting and staying committed to that journey can be." Dana, a Newmarket resident, has been with THRiVE for over five years. In addition to personal training, she also teaches PiYo, TurboKick, Intervals, and Strength training. Dana is also a certified NCCPT personal trainer, certified Weight Management Specialist, Certified Medical Assistant, certified instructor, coach, runner, and mother of boys. Zumba is a feel-good workout, a dance fitness class that incorporates Latin rhythms, including salsa and merengue, as well as belly dancing and swing, just to name a few. When you are dancing and having fun, it doesn’t feel like a normal workout. Zumba puts you right in the moment, and that is a wonderful thing. My name is Lenette Strand and I am a licensed massage therapist from Exeter, New Hampshire. I received my educational training in 2016 from the New Hampshire Institute of Therapeutic Arts in Hudson, New Hampshire. It is also with great gratitude that I was able to successfully complete my clinical hours here at THRiVE. I have training in Swedish, sports, neuromuscular, lymphatic, and cupping therapies. I work at Rzepa Chiropractic as a massage therapist, where my focus has been on therapeutic deep tissue massage. I am very excited to have the opportunity to return to THRiVE. I look forward to sharing my passion of good health and well-being! Amy grew up as a classical ballerina starting with lessons at the age of 4. She began her group fitness instructor career 2009 and today is part of the POUND® ICON team leading Pro and Amplify trainings, as well as fitness conventions. Amy hopes to continue to raise awareness around the power of human unity, emotional connection, heighten confidence and self-worth, lead by example, and change lives in a positive way. She holds both ACE & AFFA Group Fitness Certifications as well as AED/CRP. She currently teaches POUND. Brenda Towne founded THRiVE for Women (formerly Elements) in 2006, with a dream of creating an environment where women of all ages could find a path to wellness (body, mind, and spirit), and support and empower each other to achieve their fitness and lifestyle goals. Brenda’s extensive business background and savvy entrepreneurial spirit enabled her to grow THRiVE to become the premier women’s fitness center in the Seacoast New Hampshire. A huge part of Brenda’s life is her Christian faith, which fuels her philanthropy. In addition to supporting over a dozen local charities, she and her husband Rod currently fund an all-girls orphanage in Sangareddy, India. Brenda retired from THRiVE in November 2018 to spend more time with her four children and seven grandchildren, handing the reigns to Valerie Berezin, who shares Brenda’s passion for empowering women and giving back to the community. Paula has been an integral part of the THRiVE team since its inception, and in a variety of roles from childcare to payroll and everywhere in between. She can help you with everything relating to your membership. 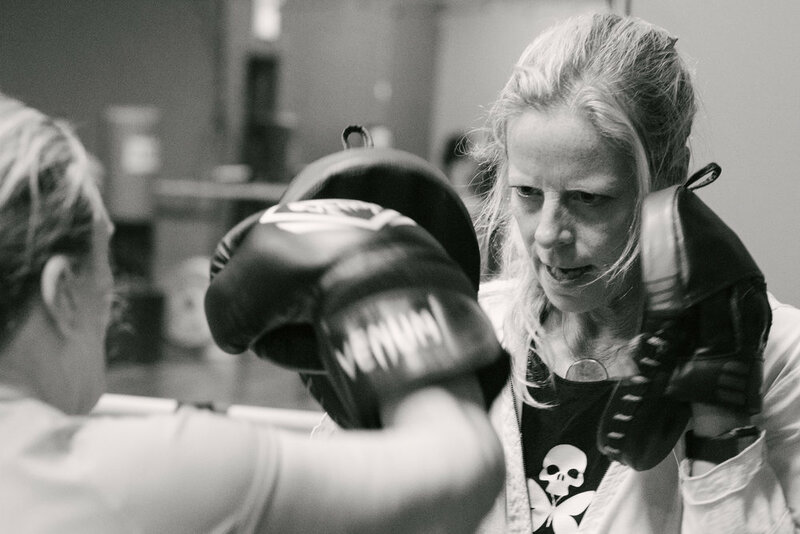 Jan joined the THRiVE team in 2013 when the gym where she had been employed at for many years closed their doors. She has extended years in customer service, ten of which were specifically in the “gym” arena, but many more were in the “horse” arena as she and her late husband owned and operated a local horse-training facility. You’ll find Jan to be quite the doting grandmother, fabulous team supporter, a bit of a dog lover (who else keeps doggie biscuits behind the front desk! ), and most definitely a lover of people. She feels best about herself at the end of her shift when she has been able to help a THRiVE member feel better about herself!! Cindy has been working at THRiVE from the beginning, and has been involved in the fitness industry for close to 40 years, going back to teaching the original Aerobics classes of the early 80’s. She especially enjoys supporting and working with women, and helping them to see their potential and achieving their goals. Cheryl is a devoted daughter, sister, wife, mother and grandmother with over half a century of experience investing in women! She is passionate about inspiring women of all ages to believe in their potential and embrace each challenge in life as an opportunity to improve themselves as well as their sphere of influence. She joined the leadership team of THRiVE in December 2006 as it was just welcoming the founding members. Intending to stay long enough to help establish a “thriving community of women”, she finds herself twelve years later still passionate about the ever-expanding “family” of women called THRiVE! In Cheryl’s own words, "I know the joy of serving side-by-side with a small, devoted team of women in the leadership of THRiVE and it excites me to see firsthand the positive influence for better that we as a team are able to make in the lives of literally hundreds of women ranging in age from 13-93! For me, the joy is in the journeying together and the reward is in inspiring women to value health, fitness and diversity throughout every season of life!" Terri joined the THRiVE team in 2012 after being a stay-at-home mom for 23 years. What she loves most about THRiVE is its wonderful members and their inspiring stories, its welcoming atmosphere, and its top notch trainers and instructors that really care about the success of our members.